Paintball and Airsoft are very fun, but also very rough sports, and if you want to enjoy it, you need to have the right equipment, such as guns, eye protection, musks, and tactical vests. No doubt, tactical vests can look really awesome and they have a ton of useful features. Tactical vests are here to improve and increase your game. 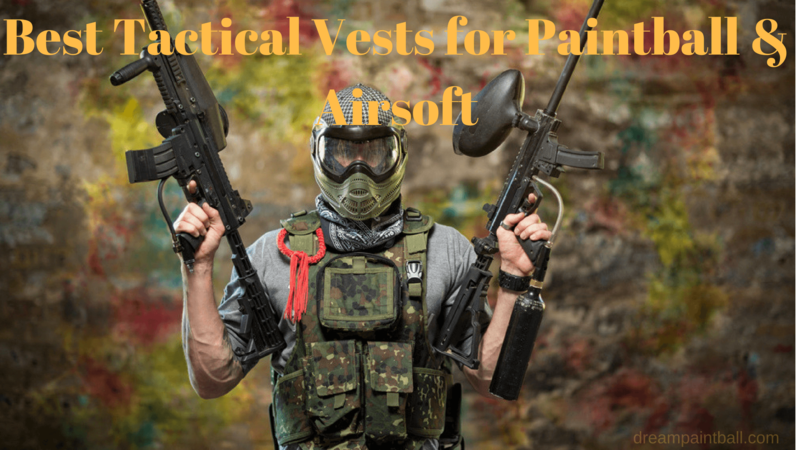 In my 8 years of paintballing, I have used a lot of tactical vests and I know it can be a very difficult task to choose the best tactical vest for paintball or airsoft. Therefore, I decided to share Top 10 Best Tactical Vests in 2019. Paintball is a game which gives us combat experience, A game which not only tests our agility and reflexes but also tests our brain’s response time. This tactical game includes and relies on many equipments, one of which is a tactical vest which you can trust in the playfield. The main thing is that your tactical vest must be high quality, rugged piece of gear with heavy duty fabric and padding. When it comes to having the best of the best, you need to pay attention to quick release clips, hydration compatibility, camouflage and pouches and pockets for magazines. Customizable layouts (the player has the opportunity to have control over what it looks like. Now all you have to do is choose, depending on your game style, the right capacity and size so the fun can start. Let’s move down to the list. Tippmann pro tactical vest is one of the best options for paintball. In this game, you need a good constant supply of accessories. However, there should be a balance between a load of accessories and the amount of material available via those accessories. If there is too much-supporting hardware, not only will it decrease your agility to move but it will also tire you out more quickly. Paintball is a very rapid game, requiring you to charge at or run every second. So the accompanying vest must be designed to be a non-hindrance accessory carrier. And, the Tippmann Pro Vest provides these dual functionalities to a great extent. This vest is a combination of a wearable vest and harness. Every vest has its own strong features. The Pro vest proudly proclaims adjustable deep cylindrical pockets for four pod packs with provision for another two on the sides, if needed. The vest is padded (which you do not always get in this price range) offering you the protection from incoming paintballs, grenades. You laugh at these tiny incoming pellets knowing that you are well secured by the padded vest. However, your foe may have a vest which has no padding, disabling him temporarily while you continue with spraying paintballs merrily. There is also standard plastic front pockets for storing maps, ids, money etc. These are protected from paintball spray and dizzy weather conditions by the zip and front lids. There is meshed hydration space at back with guides for storing the very necessary hydration bladder along with its line drawn through the guides. At almost 100 $ this vest is costly than other ones which retail around an average 60 $ each. But they do not have the padding so necessary for complete protection from incoming paintballs. Four separate mag pouches on the front with adjustable Velcro straps for accommodating different sizes differentiate this Condor Tactical Vest. Protective flaps cover these four mag pouches on the front. Another interesting feature of these pouches is that they are double layered. They can accommodate both the pistol mags and the ARTs in separate partitions within the same pouch. This increases your firepower without additional space. These are a double-pocketed pouch. The Velcro straps and flaps on this pouch hold the mags and rounds of ARTs in place while you are running or crouching, etc. Molle attachments on the sides help you to attach more mag pockets. The strap at the front has good quality clasps. However, the disadvantage of this gear is that the maximum weight of mags, rounds and pistol is placed in front while the back muscles are not utilized. Crouching, bending becomes uncomfortable. Crawling on the stomach is ruled out with this gear. This Vodoo vest has an attractively positioned removable holster. It fits on the vest at different angles. The magazine pouches are intelligently placed just on top of the holster for a quick withdrawal of both. Flaps cover the mag pouches protectively until they are drawn out for duty. This vest is highly adjustable at the waist. Velcro fasteners provider adjustment at the shoulder levels. Extraction handle is sturdy enough to support quick extraction in dangerous situations. This vest features Molle tab on the back for hydration pouch and remote lines. One amusing aspect of this Molle tab in this vest is that it enables you to attach even a gun on the backside though we admit that it is uncomfortable. It can be stated as only a functionality of the Molle tabs on this vest, which is actually used sparingly. The backside is ribbed for supporting the gun. Although the name suggests that it can be used in armed situations but in reality, it is used for paintball arms. Four rifle magazine pouches highlight it. These pouches accommodate the standard M4/AR15- 30 round magazines. This vest has a lot of Molle straps for attaching more gears. It has a mesh layout on the back intended for attaching the hydration bladder in the pocket stitched on this mesh. The pistol holder is vertical and detachable. However, we feel that a diagonal placement of the pistol holster would have been better. The belt that comes with this vest is one of its stronger points. It is adjustable and has two additional pouches on two sides of waist. It has loops on it too for additional gears. Another redeeming feature of this belt is its latches, which are almost of military quality. During the review, we found the mesh of good quality and strength. Though it has the disadvantage of lacking the pad support but the mesh at the back of this vest allows good air ventilation. Please note, though it is a tactical vest, it does not have any plate or any arrangement to support one on the vest. Do not get fooled by the holster on the left. There is no chest protection. A number of pockets exist on this vest for flashlight, magazines.etc. It’s better suited to activities like outdoor hunting rather than actual shooting purposes. Valken V-Tac Echo Paintball Vest offers you earlier mentioned important features in just one vest. It is highly known for the mobility it gives to the player. In a raiding situation where you are hustling in multiple directions, Valken V-Tac Echo Paintball Vest gives the ultimate mobility even with a load of accessories attached. The shoulder strap is padded and at the back of it, mesh cloth is used for better air ventilation and support. Valken V-Tac Echo Paintball Vest’s shoulder straps also come with Molle(Modular Lightweight Load-carrying equipment) web which lets you add more items to your shoulder strap. The waist support of the Valken V-Tac Echo Paintball Vest is very comfortable as it comes with a double velcro support, the first layer of the support is a tight and fixed support which provides a firm grip to the vest and the second layer is an elastic support which offers flexibility and does not hamper your mobility. The back of the vast comes with a rubber support which makes the vest stick to your body and makes you feel like its a part of you. The Valken V-Tac Echo Paintball Vest comes with a great feature, a hydration system, yes you can keep a water bladder in the vest itself and hydrate your body whenever you want to. Another very astonishing feature of the Valken V-Tac Echo Paintball Vest is that it comes with 9 vertical Paintball pod sleeves. These sleeves hold on very tightly to the pods and there is no risk of them falling. It is a really great option as a multi-feature comfortable tactical vest. This vest places greater stress on having as much gear latched on to your upper body as possible. For this, it has Molle panels on the front and back. There are even loops at the bottom to attach stuff like a grenade in paintball, etc. This vest has space for six paintball Pods. Also included is the space for one 90-ci tank and regulation hydration bladders. However, we found the front pouch position upper on the chest making it difficult to use. Being tactical belts, these have 10/13 plates at front and back and 6/8 plates on the sides. It’s suitable for low action duty in both patrol cars or in active shoot-outs. You will find a lot of pockets and pouches in front but there are no magazine holders, pockets or slug holders. The fit of these vests has been found to be easy and non-binding during movement. The gun holster is strapped in an angular position on the front for easy withdrawal. The gun holster can be moved back and forth (a bit) on the surface of the vest. This enables you to place the gun holster at an optimum distance from the waist for easy withdrawal. This tactical vest of Condor is modular in design The size is Fit All with the help of adjustable shoulder pads. The Molle straps allow you to add more accessories. The cons of this series of the vest are that it does not support hydration bladders. These tactical vests can hold AK rounds. The pouches on these vests can hold the AK mags comfortably. The mag holders are about 10 inches deep. However, they are not elastic to the extent that they can hold any type of airsoft or paintball gun clips or slugs. These are not meant for games such as paintball because the pockets are not wide enough to hold paintball Pods. The pouches can hold up to six – 30 rounds of AR 15. Though this is a tactical vest, do not mistake it with armor vests. It’s constructed of mesh material which allows good air passage and breathability. This retails a tad over 60 $ in Amazon. The highlight of this vest is the amount of POD space it provides. There is space for a total of 8 Pods in this vest. Note, the Pods structure is supported by mesh only and not by heavier pads. The Pods number four in front and two in back. The Pods packets accommodate both standard and lock-lid Pods. It has regular hydration pack support at back, making it suitable for longer wear periods. However, a surprising negative point is its non-adjustable shoulder straps, which makes it a suspect if you are too big or too little. There is a surprising drain hole at the top left of this vest either to drain water or for air passage. However, we wonder what practical purpose does this tiny hole serve? On the upper left corner, we have the regulation radio pocket. One surprising but pleasant feature of this Empire Paintball vest is the number of Velcro’s on the front, which can be taken out and inserted in at will. The combination of Velcro’s creates a wonderful series of pouches in front with their size and depth customized to your will. The surface of this vest is mainly the mesh, which makes it breathable. As opposed to the previous vests, this Gen X vest has no Molle tabs at all. But, it has a lot of pockets to stuff. The front pouches are meant for Pods, but unlike the previous vests we discussed here, these pouches do not have protective flaps over them. We found the Pods to be very tight fitting and had difficulty in extracting the Pods quickly, which is definitely a downer for quick play. A good feature is an addition of pouch on the sides for inserting simpler stuff. The radio pouch is strapped on the left front above the four POD holders. It has normal adjustable shoulder straps. We found the front finish likable. To cut corners this vest has no padding. The main stress here is on capacity. There are pockets for four Pods on the front. These POD pockets can accommodate 4 -140 round Pods. Agreed, this contraption is less costly. However, the design with all the POD pouches attached rigidly at the front only is not up to mark. The weight distribution becomes (more heavy on the front) uneven, which will affect the players especially during running or crawl. If a product is affordable, its product’s quality should suffer. Unfortunately, these vests from JT paintball have been found to have broken straps or POD holder getting loose after intense activity. This brand of the vest is not suitable for extended sessions. The focus of this vest is on the capacity of pods, and you can manage 15-20 minutes of say max 3-4 sessions of paintball with one refill of this vest. It retails around 28 $ only at Amazon. Here we end a brief summary of the 10 vests available for paintballs and tactical purposes. Every vest has its own pros, cons, and character. It is up to you to choose the best after going through this article and further reviewing it via other media sources. Next Article Should You Buy a Paintball Players Pack?